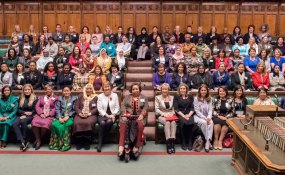 Participants at the Women MPs of the World conference in London in November 2018. Female parliamentarians have called for a global network to combat issues including online abuse from the public, threats to their safety and discrimination by male colleagues. "Women in parliament are pioneers," said Harman, a member of the opposition Labour party who is the longest-serving female MP in the British lower house of parliament, in a statement. "We have been elected to sit alongside men in our legislatures. But we are, as yet, not on equal terms." "Virtually all" taking part reported they had faced opposition to their participation in politics, including abuse online and threats in person, said the report on the first "Women MPs of the World Conference" in London last month. Many said they had been "overtly discriminated against" by colleagues, including not being called on to speak and being blocked from taking roles on committees. "Sexism and sexual harassment ... should not exist in politics, nor anywhere else," Silvana Koch-Mehrin, the founder of the Women Political Leaders Global Forum, told the Thomson Reuters Foundation. "We welcome every effort to combat such discriminatory practices."